DD5LP/P – March 15th. 2017 – DM/BW-484 Bussen. Bussen is the summit that I had originally planned for the VK-EU SOTA S2S event the previous Saturday but as I wasn’t feeling 100% the early rise and long drive was not attractive. As the weather improved (spring has arrived – maybe…) I decided I should try to activate Bussen BM/BW-484 with its 8 activation points before the end of the winter period to grab was I thought were it’s 3 winter bonus points. But on the 15th. 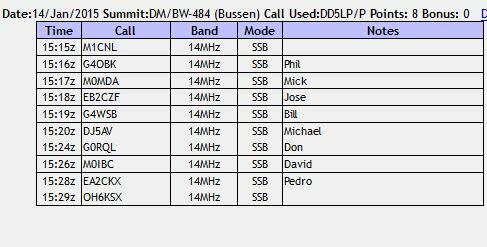 March, when I got up, I checked and realised that since 2009 Bussen no longer gets any winter bonus points but as all was prepared I decided to make this a 60 metre and 40m activation as I had completed the needed mods to my FT-817ND to enable it to operate on the new WRC15 60m band. Equipment to be used would be the FT-817ND plus amplifier for 40m and the SOTABeams linked dipole that I modified a few weeks ago for 60m. I also packed the screw-in base, that had worked so well at Berndorfer Buchet, and Rentschen (although I found a great “natural” mast support as it turned out). 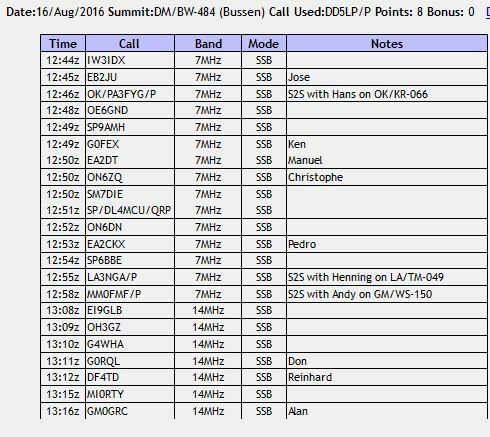 I would not bother with the unreliable DX-Wire 10m mini-mast on this activation rather, stay with my old, trusted LambdaHalbe 6m one. Bussen is an 8 point summit roughly half way on a line between Lindau and Stuttgart. According to Google it’s between a 1hr. 40 min and 2hr. drive from my home location, depending upon traffic. Bussen, with its church and castle ruins can be seen from all around the areas on its 767m high hill in what otherwise is a relatively flat area. The views from the summit are awesome when the weather is clear, which it was for the first time for me on this activation, my previous two activations were either in fog & rain or snow. access to the summit is restricted for vehicles and so one needs to park in the car park below the hill and walk up what is a very steep hill to the church and then across to the grassy area between the church and the castle ruins, where the trig point stone is also located. I had decided to set off a little later so that I had time to take the dog for her walk before I left and as I was not trying to meet the long path propagation window, I was more flexible with the times. So at about 9:30am local time I set off, expecting to miss the heavy traffic as well. While this was mostly true on the Autobahn, I was surprised to see so many large trucks on the small country roads that would make up 3/4 of my drive. Being stuck behind a line of trucks, without any safe chance of overtaking them can be annoying however most of these truckers were driving at 60 Km/h or even 80 Km/h when they could, so the difference in time taken compared to running at the 100Km/h speed limit of these small roads was not that great. The journey to Bussen took almost 2 hours however the return journey was completed in just 90 minutes as there was far less traffic in the afternoon. On arriving at the car park, I packed just what I thought I would need and left the screw-in base and the 10m mast (taken as a spare) in the car as previously I had managed to fasten the mast to the concrete and wood benches and tables and hoped to do the same again. After slogging up the hill to the summit I arrived at the benches only to realise that the trees above them have grown more lower branches and these would be an obstacle to the mast and antenna. I decided to take a look at the other side of the park area away from the benches to see if I could find anything there as a mast support and was amazed to find a couple of concrete round hollow pipes in the ground, that while a little large, using the loose wood that was laid around as packing could indeed support the mast very nicely. This side of the park, being near the cliff edge, has less trees and I was able to find a good location for the antenna. One “Ooopsie” as I was putting the mast up one section came out of the lower section and I was left with holding the mast and antenna with one hand and the mast’s bottom sections still sat in the ground! I knew I shouldn’t have cleaned the mast!! In any case – no biggie lowered the top sections with the antenna over to the ground, removed the antenna and then unscrewed the bottom cap off the bottom of the mast and slipped all the sections back into place. Re-attached the antenna and (carefully) up went the mast again, with no problems this time. I was really happy with 60m. First of all I thought I would not have a chance to use one of the just two frequencies that overlap between the UK “bandlets” and the IARU WRC15 band. One of the frequencies had some kind of radar interference on it, the other had a CW operator. Oh well I thought – if the CW Op doesn’t get a response – which he didn’t, I’ll take that frequency, spot and call CQ – the result was 8 contacts. One into Slovenia, two Switzerland, two England, one Germany, one Ireland and finally one Belgian station! After switching to 40m, it was crazy! 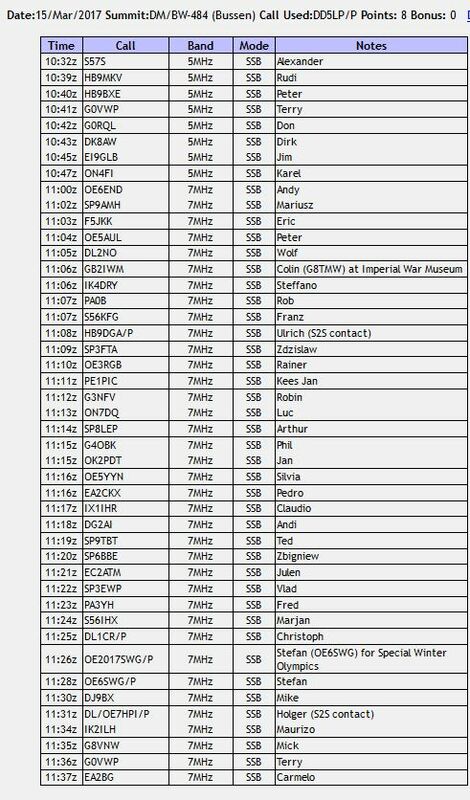 37 contacts in 37 minutes, including 2 S2S and 2 Special Event stations! It looks like conditions are particularly good around lunchtime on 60 metres as all the stations were booming in and I was getting loud reports as well (remember 60m is a maximum of 5 watts rig output for 15w EIRP at the antenna for WRC15 countries). SOTABeams linked dipole modified for 60 metres. A nice activation where 60 metres performed very well around lunch time. When considering winter bonus points, make sure I read “the small print”! DD5LP/P – August 16th. 2016 – DM/BW-078 Römerstein & DM/BW-484 Bussen. After considering activating a new 4 point Tirol (Austria) summit (which I had not activated before and hence was not sure about the best access route and how long the walk would be), I decided, I would like to go back to Römerstein and Bussen, which I had not yet re-activated this year. Neither of these summits have difficult or long access routes from the car parks. The distance from the Römerstein car park is about a 15 minute walk up a forest path and Bussen is a (very steep) road access taking about 10 minutes. The problem with activating these summits is getting there from where I live. It takes over 2 hours on Autobahn’s that are constantly being repaired and small back roads where it is very easy to take a wrong turn and get lost. Since last year however I have changed car and installed a proper car GPS/Radio unit, so I have that rather than relying upon the GPS in my mobile phone. This would be a good test for the car GPS. The day before the planned activation, I programmed in both the complete circle route and favourites for each point – Home, Römerstein and Bussen. Radio equipment was checked and charged. I decided to pack the SOTABeams linked dipole rather than the Aerial-51 OCF in the bag as I only intended operating on 40m and 20m and the linked dipole is lighter. RF would come from the FT-817 and my much modified Ramsey amplifier. Both of these units now run off internal LIPO batteries with the option to run off external supplies as well if required. I would normally also carry a second battery for the FT-817 but after checking it and finding it had expanded itself to a size that could no longer fit into the FT817 case and also didn’t seem to be holding charge, this (now 4 years old) battery was thrown out and a replacement ordered. Unfortunately by the day of these activations, the replacement hadn’t arrived. In fact it arrived on the day of the activations but after I had left home. In any case, I only intended making a 20-30 minute activation on each summit, so the existing batteries capacities should be enough. As far as the small (1.7Ah) LIPO in the amplifier was concerned, I did not have any experience how long it would last as on the previous activations I had only used it for a short time. This would be a good test. The amplifier runs on 16V and hence this internal LIPO is a “4S” model. I do have a 3S LIPO and inverter, that I can connect into the amplifier however I don’t like using this as the inverter causes a level of extra RF noise. I now have a 4S external 5aH LIPO as well but at the moment don’t have the needed power connector on that set-up. So on this activation it would be a test to see how long the battery lasts in the amplifier. As it turned out it did sterling service on the first activation but was totally drained by the start of the second activation. My old, repaired 6m squid pole was to be the mast for both activations although I also packed my 10m one in the car as backup. In both of these beautiful locations, the 6m (realistically 5m), elevation of the inverted V dipole is sufficient and carrying the twice as heavy 10m pole up the hill is not justified. The locations were DM/BW-078 Römerstein and DM/BW-484 Bussen. Both of these summits are about 2hr. drive from my home QTH. In fact about 2 hours to Römerstein, then 1 hour from Römerstein on to Bussen and then nearly 2 hours home from Bussen, so a lot of driving is involved in activating these two summits, but they are worth 10 and 8 points respectively. Both locations are some way away from the main routes (Autobahns) and involve some “interesting” country road driving. Please refer to my activation report from 2015 to get more route details and pictures of the Römerstein car park that I use. Römerstein is easy access with just over a 1Km (15 minutes) walk from the car park on the main road. The weather was fine, but just in case I packed a light rain jacket but didn’t need it at Römerstein. The track from the car park is clearly marked and after about 700m joins the forestry road to take you to the top of the summit with it’s tower, hut and picnicking area. When I arrived there was a farmer just finishing off cutting and collecting the grass but apart from that I had the area to myself. I had promised myself to go up the tower to take a look at the view however unfortunately the tower was locked and while the address and phone numbers of three key holders are shown on the door, I didn’t want to go to that trouble in the time I had available. I looked around and decided to set up in a group of camping tables that were partially in the shade from the, by now quite warm, sunshine. I used one camping table to support the base of the mast and two others to ties the ends of the dipole off to. A fourth table fully in the shade became my “shack” where the gear was set-up. There is a lot of space ot this summit, which was good as a large family group arrived about 10 minutes later and cooked their lunch at one of the open hearth grills. They used a couple of the other camping tables, so no issues with the antenna wires. They never came over to ask what I was doing, but I had the info brochures out, just in case. I checked activations that were currently on via Rucksack Radio Tool on my smart phone and decided that the most were on 20m at present, so the dipole was initially set to 20m. I listened for the spotted activators without success, so found a free frequency, started calling CQ SOTA and self spotted (cell phone coverage from both of these summits is fine, so internet – 3G connectivity is no problem). 22 contacts followed in the next 17 minutes. The 25w from the amplifier certainly makes sure I received in general very strong reports, 5-9 was not unusual. I constantly check for other activators and now a couple had popped up on 40 metres, so down came the antenna, the links were changed and it went back up. My first contact, now with 35w from the amplifier was an S2S contact with OM1DK. Following this, I found a common SOTA frequency 7.118MHz to be free, self spotted and started calling CQ again. 16 more contacts followed in the next 16 minutes. The last of these being another S2S this time with Steve, G(M)1INK/P. It was now time to pack up and head to the next summit. As I started to pick up however, I saw a new activator Petrica YO9RIJ had just spotted himself on 20m, so a quick change of antenna and amplifier settings and I grabbed another S2S before finally packing up and leaving down the track, back to the car. Bussen. Upon reaching the small park area on the summit between the church and the ruins, I again selected a camping table. This time only one with the ends of the dipoles being pegged into the grass at each end. Set-up went quickly and without problems. When I put out my first call however I had a reply from David IW3IDX to tell me that my audio was distorted. It was at this point that I realised battery levels after the level of activity at Römerstein were depleted. The first action was to turn off the speech compressor that I have built into the microphone and probably doubles the effective output of the rig – but of course also then draws twice the current. The audio on my signal was then fine, but later I saw that the amplifier kept dropping out and I switched to running the FT-817 barefoot at 5w output from Bussen. The conditions had been quite stable from Römerstein however at Bussen signals were up and down to a ridiculous extent with stations often varying between S1 and S9! It is nice that even an S1 signal is able to be heard (albeit only after putting my headphones on) from locations away from metro-noise. 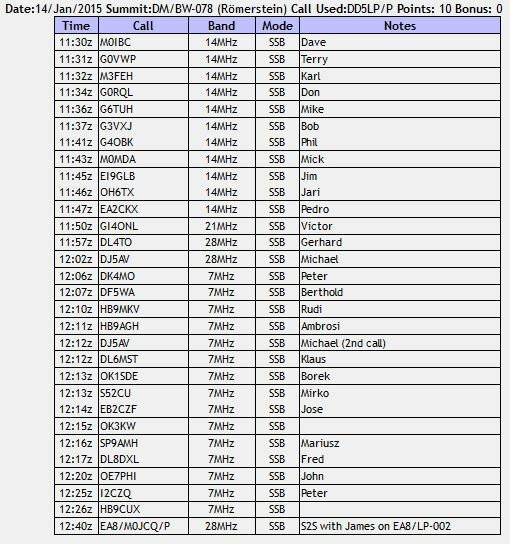 With the reduced power I thought I may have some problems getting contacts however 22 contacts are in the log from the 30 minute activation. 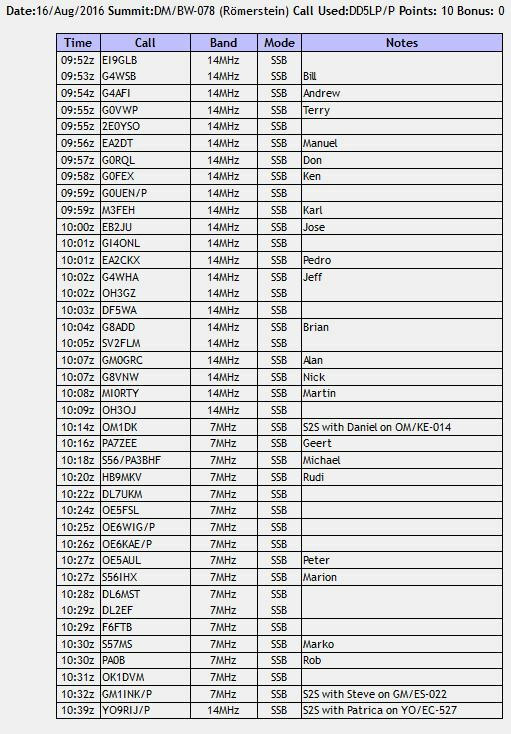 That included three S2S contacts – Hans OK/PA3FYG/P on OK/KR-066, Henning LA3NGA/P on LA/TM-049 and Andy MM0FMF/P on GM/WS-150. That last one took some getting as we were working at true S1 levels in both directions and by this time I suspect the FT-817 was probably down to 2.5 watts output. Partially due to the battery situation and the fact there seemed to be less contacts available on 20m & 40m, after 30 minutes at Bussen, I decided to pack-up and just as I got the last item packed into the rucksack, the rain started. So I was happy I had packed my light rain jacket which I put on for the walk back down the steep hill to the car park – at which point the rain stopped. The drive home, still using the GPS was “interesting” and at one point, it or I, made a mistake and the corrective route took me over some single lane farm roads and numerous small villages until we got back to main road to the autobahn system. I was glad to get back on the autobahns – that was until I got stuck in a 5km. traffic jam for over 20 minutes just 45 kilometres from home. The delay being caused by one group of road workers slowly packing up their equipment and chatting, while causing chaos on the 2 lane section (now reduced to just one lane) autobahn. I was glad to get home and relax after about five hours driving during the day! I need to plan my battery usage better. Having the amplifier in circuit makes making contacts easier, so I either need to carry a spare/external battery or plan shorter activations. This comes down to a weight question again – for easier summits the extra battery weight may not be an issue. For more difficult summits I will need to monitor battery levels better.